It would take more than a nuclear explosion to stop everyone’s favorite violence-loving lawman! David Rasche returned – along with co-stars Anne-Marie Martin and Harrison Page – in the surprising (because nobody expected the network to renew it) second season of the series that Entertainment Weekly calls “absolutely hilarious.” These are the infamous final episodes featuring such guest stars as Richard Moll, Ray Walston, Edy Williams, Bud Cort, Bernie Kopell, Adam Ant, Davy Jones and more, in the “sitcom for people who hate sitcoms” that remains one of the most dangerously funny shows in TV history. SLEDGE HAMMER fans, take cover! These 19 complete episodes are fully remastered and armed with an all-new arsenal of Extras, including cast and crew featurettes, 4 audio commentaries with Creator Alan Spencer – accompanied on one by Actress Anne-Marie Martin, rare commercials, trivia games, network apologies and more – all personally supervised by Executive Producer/Creator Alan Spencer. 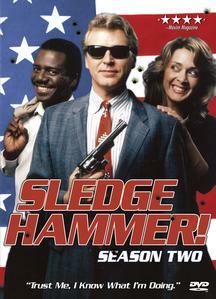 * Top 10 Questions About SLEDGE HAMMER!